Money tree (pachira) is said bring good luck & is a favorite plant for applications of Feng shut. The tree offers shiny, hand-shaped leaves that lend it a decidedly tropical appearance. You may also see several money trees grown together in a single pot with their trunks braided together. This is common way to make it look more decorative & doesn't harm the plant at all. No matter which way your money tree is shaped when you get it, the plant does best in a bright spot & regular watering. This is a good houseplant if you tend to overwater plants, as it appreciates (but doesn't need) constantly moist soil. Being a tropical, money tree also appreciates abundant humidity. If the leaves start to have brown, crispy edges, placing it with other plants or near a small humidifier can help. Money tree is frequently used as a specimen for bonsai, as well, & can develop a Fat, dense trunk. 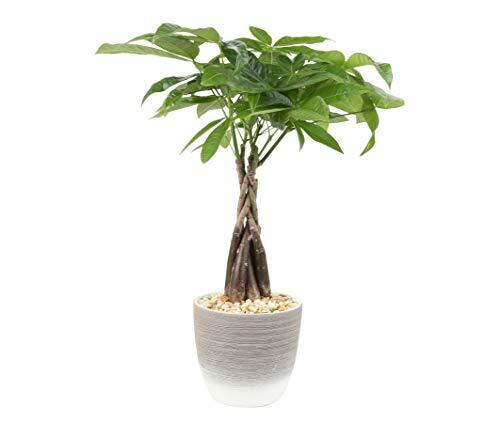 If you're looking for a cool houseplant, money tree is definitely one We'd recommend because of how easy it is to grow & it's delightful character. Plants are living things; each one is slightly different, so the plant you receive may vary from the photo. Our growers hand pick the healthiest, best-looking, highest-quality plants. We package our plants for shipment with great care so they’ll arrive at your home ready to be displayed. We're unable to ship this item to: AK, AZ, ca, gun, hi. Our plants come in pots for all decorating needs: shelf size (7-14in tall), tabletop (16-24in), & Floor (24-48in). look for Costa Farms when buying plants online. Be aware of third-party sellers; other companies try to imitate our quality. There are no other authorized Costa Farms sellers. Look for “ships from & sold by ” to ensure you’re getting our premium plants. Shipped fresh from our farm to you, Costa Farms is passionate about delivering happy, healthy, beautiful plants.